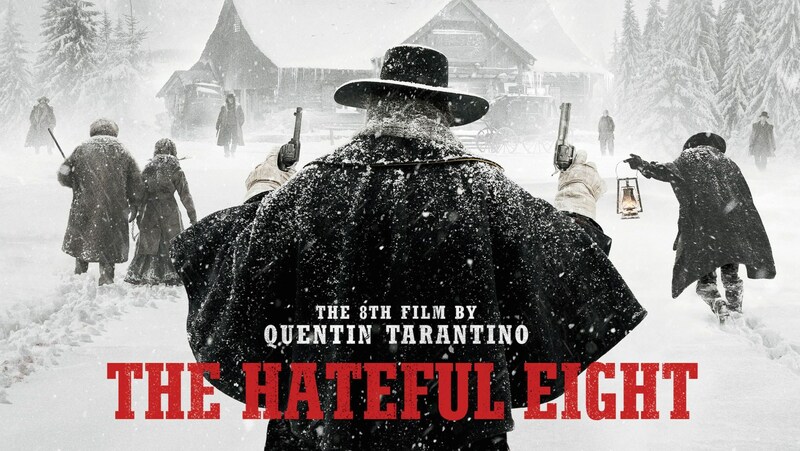 The Hateful Eight, the long awaited eighth movie by Quentin Tarantino, if we forget the flick Death Proof which is part of the double feature Grindhouse together with Robert Rodriguez’ Planet Terror, is a return to the westerns from the sixties, especially those of the two Sergios. Leone and Corbucci that is. 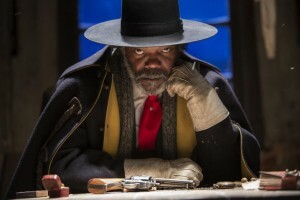 After the script has leaked online, The Chin considered publishing the screenplay as a novel instead but Samuel L. Jackson convinced him to direct the movie anyway. John ‘The Hangman’ Ruth and his hostage. Although the movie should not be seen as a sequel to Django Unchained, the setting is the Reconstruction Era whereas Django’s story unfolded just before the outbreak of the Civil War. 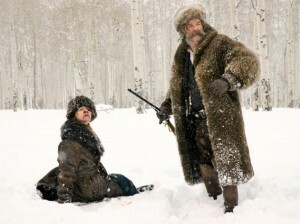 Through the snowy fields of Wyoming, a stage coach transporting bounty hunter John ‘The Hangman’ Ruth and his prey Daisy Domergue (Jennifer Jason Leigh), travel to the city of Red Rock where the latter is to be hung. Along the road Ruth, portrayed by Kurt Russell somehow resembling western legend Charles Bronson with a huge moustache, picks up two uninvited guests whose horses ‘broke down’. The first is a colleague of his, Marquis Warron (Samuel L. Jackson) and the second is the self acclaimed sheriff to be of Red Rock (Walton Goggins). Since there’s a blizzard coming up, our party decides to halt and spend the night at Minnie’s Haberdashery. Upon their arrival Warren is surprised to hear from a Mexican stranger that Minnie and her husband Sweet Dave have left to visit her parents and asked him to keep an eye on the cabin. However, they turn out not to the only guests. Our fellowship is accompanied by a veteran general from the Civil War (Bruce Dern), a quiet writer who sits in a corner (Michael Madsen) and an eloquent Englishman with the distinguished name of Oswaldo Mobray (Tim Roth, who tries a little too hard to impersonate Christoph Waltz‘ character in Django Unchained). This claustrophobic cabin happens to be the setting for the next two hours of the film and most of the events remind us of Tarantino‘s previous work. Remember the opening scene from Inglorious Basterds where Shoshanna and her family hide beneath the floorboards? Haven’t we met bounty hunters and liberated black cowboys before in Django Unchained? Don’t we recognize the same tension, suspicion and the final confrontation from Reservoir Dogs in his latest movie? Not only does Tarantino reuse his own work, he also seems to have watched The Thing by John Carpenter before shooting The Hateful Eight. The snowy landscapes, the isolation, the suspicion, the barricading of the door and the lead rope to the bathroom all look quite familiar. Apart from the lack of creativity, the length of the film and the slow tempo take away lot of the suspense of the movie. Needless to say, there will be blood, plot twists, long monologues and funny dialogues, but there’s nothing that we haven’t seen somewhere else and in a better way. The Academy Award winning soundtrack by western maestro Ennio Morricone helps to relieve the pain. Tarantino wasted a chance to release a hell of debut novel instead of a so and so film.